An interview with an IWW member in Miami about working in hotels. 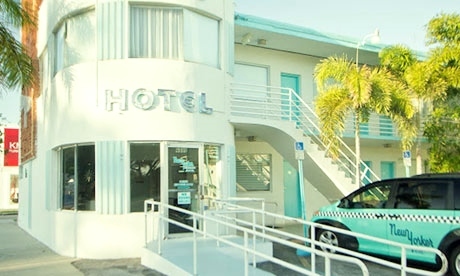 In November 2013, the Miami IWW interviewed one of its members, Eduardo Segundo, about his organizing and experiences in a high-end hotel in Miami. Miami IWW (M): Describe your workplace. Who were the clients, workers, and how was the environment when you got there? Eduardo Segundo (E): It was a very draconian-style workplace, so for example, if the boss didn’t like the stubble under your chin, or didn’t like the dirt on your socks, that was considered a heavy burden. They would call you out on it—it was that kind of workplace. It was so trivial at the time; I didn’t really know what to make of it, but I knew what I was getting into (i.e. high-end hotels have an orthodox view of how particular employees should look). I mean, right from the very start, I saw all kinds of things: degradation of female workers, atrocious treatment of immigrants, management being unorganized in every aspect (from the kitchen to the pool). During that time, I didn’t really know anyone, and even when I did, which was only a few people, they didn’t have much of a reaction to the abuse (most of the workers had years of experience under these conditions and were already ingrained into the system). As for patrons, they were mostly CEOs, and their families, celebrities, all those sort of people. In fact, whenever a big-shot venture capitalist showed up, they’d make a big fuss out of it by printing a shot of his face, his biography, the kind of foods they liked, what time they wanted their alarm to be rung, all kinds of interesting things. M: What about the workers like you? Mostly young? Immigrants? Low wage? Or more of a spread? E: Yeah, it was mixed—old, young, immigrants, gays, etc. I can’t say it was low wage, because in my opinion, all wage is intolerable, but I guess there’s a so-called thing as humane wages. I think the wages were fair, to some extent, but no one’s ever content with any kind of wage. Look, whatever the wage was at the time, it didn’t matter, we wanted more. I mean, why should the manager be paid more when all he ever did was stop by the kitchen and pick out fries? M: In that situation, were workers talking about the problems or was it just something you noticed? E: They were, but the guys who were talking about it were ones who came from a union background; in fact, there were two brothers who spark my memory, both from Chicago, and they were the ones who had some idea of how helpful a union would be. Again, most of the workers—I know from experience— are already ingrained into the system: they speak when only they’re spoken to. That kind of militarized-style of hospitality only leads to the worst kind of conformity. So there was a ton of isolation, mainly because of the competitiveness, but there were sectors of the pool and beach who spoke out against it, but it was nothing too noticeable. If you were lucky, like these two brothers, then you already knew the situations at hand. M: What got you to start organizing there? Was there some spark or cause that made you think it was time to start doing something? E: It’s the service sector, why waste a second not to organize? This is an industry that takes you nowhere, unless you want to reach the level of management, but even there, you’re someone else’s boss. But to more accurately answer your question, the spark comes at the very second you walk into work and punch in: you’re working for someone else at that point. M: When did you start to think you could fight back though? From the beginning? E: My gut feeling was that there was something I could do, it’s just that I didn’t know how to, hence I joined the IWW. And the IWW was helpful. For instance, the IWW provided workshops that were tremendously helpful in assisting me in ways to work and combat these systems of power. And I used them, to the best extent I could, but if it weren’t for the IWW, I would have had zero knowledge about the interventions of a business union (and I was approached by them, too). So from a revolutionary perspective, it gave me an open eye—fighting back, that is. Fighting back doesn’t mean throwing yourself into the pit; it means getting along with others and doing things collectively. In fact, another worker and I fought for better pay and we managed to get $10.50 an hour for food running, up from $10. But if it weren’t for my co-worker, that wouldn’t have happened. I had to convince him to fight for better pay. He was fine with $10 an hour until the workload picked up. It took him a while but I got him to fight with me. M: How did you convince him to fight? And how did you all win that raise? E: He was the food-running veteran. He was hired as a barback but eventually they forced him out and into food running. When I got there, it was just him doing the work by himself, but at the beginning, it was slow. I maintained loyalty with him, but I was always persistent and I wanted him to know that he was worth more than what he was bargaining for. Every worker is worth more than what they’re paid. That’s not even an argument; you have to be a fascist to argue otherwise. But anyway, when we were hired, they were paying him $9 an hour as a food runner; another runner and I were getting paid $10. It wasn’t until he found out about the pay disparity that he really became angry. We didn’t know it at the time, but they eventually back-paid him all the dollars for that month. M: How did that happen? Just by confronting management individually? E: No, collectively. He was getting paid the wages he worked as a barback. When they transferred him as a runner, they just kept him at $9 (the wage actual wage for a runner is $10). M: Did that include the raise to 10.50? Or did that come later? M: How’d you get that? E: Same, we went to the manager. The managers promised us a raise, but it wasn’t easy. We had to ask every week, reminding them...The managers had so much to do, because of the busy season, and just to find time for us...I thought we got lucky. I mean, managers were clocking in at 7 a.m. to help whatever way they could (of course, all the real physical labor was on the workers), but they were stressed out. M: And eventually they gave in? E: They did, but only with that issue. We had other issues, all completely ignored, as usual. M: Were there ever times when your co-workers confronted management together? E: Oh, yeah, of course. I remember one time, a female pool server was demanding promised pay or something, but it was only involving the servers (the majority of whom were females). I was at my lunch break, and I saw this pool server confront the boss, I had never seen anything like it. But she was demanding better pay or something like that. M: Anything come of it? E: No, nothing. Just promises. M: Anything you would do differently a second time around? E: Doing things a second time around means learning from your mistakes—and there were mistakes, without a doubt. Personally, I’m someone who goes through SAD [social anxiety disorder] so just talking in groups or whatever is a tough task in and of itself. Having joined a syndicalist union has helped me to break these fears, it’s helped me to jump into situations which I would have never dared to do. Furthermore, just having a base of solidarity has played a critical role in my politics, which is why I joined the IWW in the first place (I’ve been anti-authoritarian since I was a kid). It’s the service sector, why waste a second not to organize? This is an industry that takes you nowhere, unless you want to reach the level of management, but even there, you’re someone else’s boss. So 2018 'high-end' USA hotel workers in mainstream unions organising strikes fo improved wages and conditions but not sure how effective or widespread these are. Same hotels are international with generally poor conditions especially amongst cleaners who have organised in the UK through smaller 'base unions' across sectors but with still a long way to go to impact in the hotel sector. The hotel industry is going to be going through a lot of changes in the next few years, primarily automation of many jobs formerly done by humans (check in kiosks, roboticized housekeeping etc). Alot of the larger hotel chains such as Marriott are enjoying record profits as well, while workers are making the same low wages that they received 20 years ago and depending on the uneven U.S. tipping system to close the gap, when applicable. I work in a hotel in a tourist destination and as a part-time bartender make probably more than anyone in the hotel outside of management. These hotel strikes were news to me and when I went to picket lines in Boston to learn more I was brushed aside. No one could even tell me the list of demands or point to someone who could help me further. I'd like to organize a city wide discussion amongst people in my industry but UNITE-HERE seem only interested in their narrow purview. Another struggle coopted and likely lost by conservative business unions.